Editors note – With the inpending release of the windows 8 tablet (microsoft surface) there are a world of reviews out there, this is the most acurate review we could find. We hadn’t looked forward to something this much in a long, long time. Now it’s here. And it’s been just as long a time since a gadget has been so disappointing. Surface is good, but Surface RT sure isn’t the future. Not yet. The laptop is about as far advanced as one can imagine. The MacBook Air and a horde of ultrabook clones are hitting a brick wall in terms of form and physics. The tablet, likewise, isn’t exactly pushing civilization forward; it’s still fundamentally a luxury device, a delightful toy for reading email on the couch or watching Netflix on an airplane. Nobody needs a tablet. It’s a lovely, superfluous thing. But everyone needs a computer, unless you’re planning on living by a lake and trading furs for a living. Microsoft’s pearly promise for Surface was to pioneer a strange new kind of gadget: all the grace and leisure of a tablet, combined with the ability to actually make stuff that a computer brings. Convenience with input. Type, edit, change. Work. Power! Microsoft claims outright that Surface will bring together the best of everything that exists—the elusive union of laptop and tablet. Or at the very least, with Surface RT, a tablet that you could actually use as your primary computer. The men who built the Surface from a pile of cardboard prototypes into the thing I’ve been using for the past week stood in front of me at their headquarters and said exactly that. Microsoft is trumpeting a historical change here. And it has a recent track record of building exceptional things. Sure, there’s a Surface Pro version coming up that’ll have full, powerful laptop guts, and run the same software any PC can—Microsoft’s best shot at being your only computer, forever. But even this RT variant is supposed to give us some overdue synthesis. Plop it down on your desk and get things done. Whether Microsoft can keep this promise matters more than anything else in technology this year. 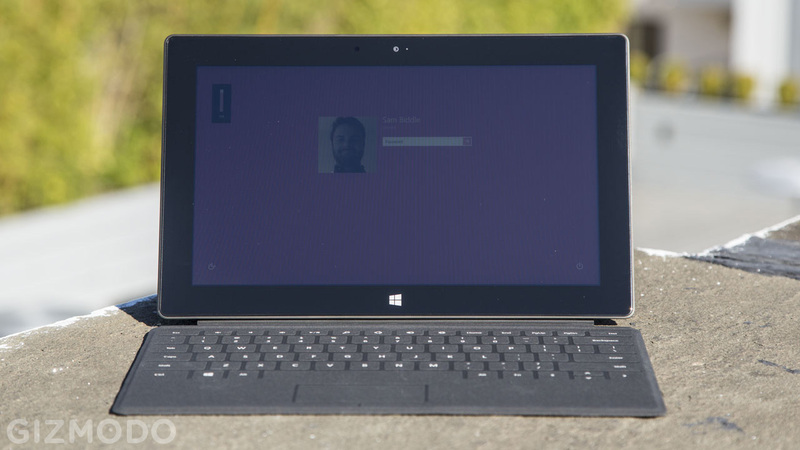 Surface could be the blueprint for the machine you’ll be typing on well into the next decade. No pressure. Surface is Microsoft’s attempt to out-Apple Apple. The thing is designed to hell and back, and most of the time it shows. This means a lot of attention to detail—attention that sounds silly until you actually hear it—like the kickstand with an extra, custom-designed hinge to guarantee a satisfying chkkk every time it’s snapped shut. Is that superficial? Only if you consider something you’re going to potentially hear and touch multiple times every single day superficial. Otherwise, it’s just damn thoughtful. And most of the time, Surface is a thoughtful computer. It’s a beautiful computer, in your hand or on a tabletop, its shifting angles clean and secure like a Danish prison. It’s a little too heavy—slightly heftier than the iPad 3—but otherwise comfortable to hold, with an angled bezel that melts into your hand. There’s a convenient USB port that, unlike other tablets, doesn’t look like a gaping open sore on the delicately chamfered side. The screen doesn’t hold up against the crispness of the iPad’s retina resolution, but still manages a lovely colorful pop to suit the colorful, poppy Windows 8. All over the Surface, these little details reflect the meeting of large brains. But more importantly, Surface is handsome. That ineffable Hey, this thing feels good quality is lacquered all over Surface. You’ll appreciate it every time you pick it up and turn it on. It’s a simple, joyful experience. 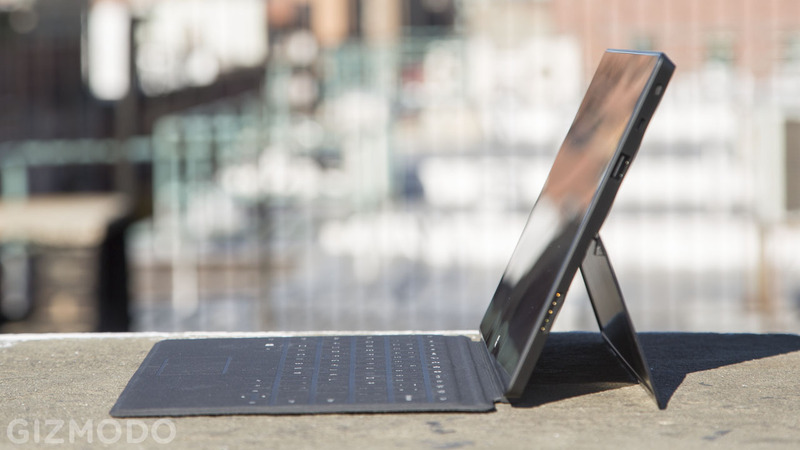 Open the Touch Cover keyboard/trackpad hybrid, snap out the kickstand, and lay the thing on your desk like a laptop. Start writing an essay. 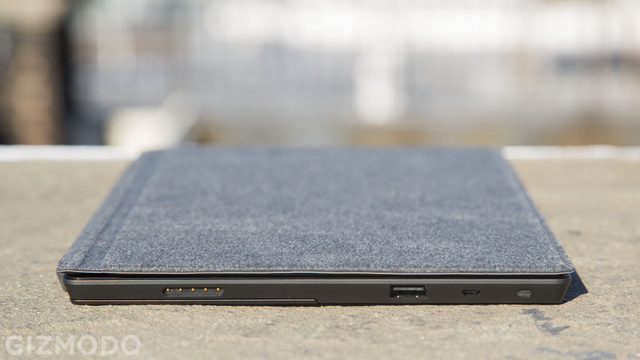 Flip the cover all the way around, hide the keyboard, and give yourself something substantial to grip like a tablet. Start swiping the web. Or prop the kickstand against the folded-back cover to create a stable base while you watch Netflix on a coffee table. Switching configurations is a cinch, and it’s entirely intuitive. The Touch Cover feels as integral to the Surface as the binding of a book to the sandwiched pages. There’s every reason to believe most computers will look and feel something like this, someday soon. The Surface is instantly more charming than any Windows device that’s come before it. It’s nearly the perfect size, and the form is almost beyond reproach. If you want a tablet, use it like a tablet. If you want a laptop, use it like a laptop. Both modes seem right, like a genuine seachange step forward. The Next Kind of Computer can be slipped in a bag, power up a bright display nearly instantly, run an operating system that loves being touched, and equally importantly, have a keyboard you can use to actually get work done. Flip out the keyboard. Hit power. Swipe up to unlock. Type in your password. A dozen super-colorful tiles give you a snappy report of what’s new: Who’s tweeted at you, what’s arrived in your inbox, news headlines, photos of your beautiful face, and incoming Facebook IMs, as they drop. You’ll touch one thing, scroll to the next, swipe another, then begin typing, merging habits you’ve picked up since your parents first let you set hands on something that ran off batteries. Surface presents you the Internet all at once. You can thank Windows 8’s radicalism for that. Traditional Windows would be absolute hell to use on this—or hey, so would OS X. But Metro is the best foundation for The Next Computer I can imagine, and if you can get over UI squeamishness, you’ll love it. It’ll make you more powerful the more you rub your hands on it. It is that good. Or at least it could be, at some point. We’re not there yet. Surface is a fantastic promise, and holds fantastic potential. But while potential is worth your attention, it’s not worth your paycheck. Surface RT gets so many things right, and pulls so many good things together into one package. But it is undercooked. For all Microsoft’s claims to hardware perfection and software revolution, Surface RT is undone by too many little annoyances, cracks, and flaws. After the initial delight of an evolved tablet wears off, you’ll groan—because Surface brings the appearance of unity, but it’s really just the worst of both worlds. Instead of trading in your laptop and tablet for Surface, a cocktail of compromises that fracture the whole endeavor, you’ll miss them both urgently. Want to use Surface RT as a laptop? Sorry, the Touch Cover is a letdown. It’s a phenomenal engineering effort, and the most terrifically-integrated mobile keyboard ever. It doesn’t compare to the junky Bluetooth options you can slap against your iPad. 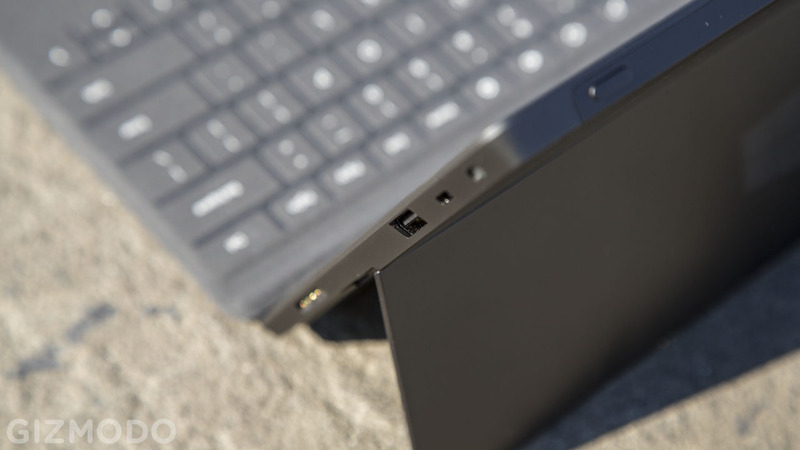 Microsoft’s keyboard cover is perfectly integrated with the device, and touch typing on it is actually possible. You can’t say the same for the iPad’s glass. But it only approximates a real keyboard—the buttons are pressure activated, barely buttons at all, and spaced in such a way that typos are inevitable and constant. Unlike the first time you pinched an iPhone or gazed at E-ink, there’s zero that’s instantly intuitive about the Touch Cover. And in order for this to be a brave new computer, Touch Cover had to be instantly intuitive, an immediately responsive thing to touch and work with. But rather than feeling like you’ve instantly grown an extra brain lobe just by using it, Surface’s mega-hyped keyboard cover feels like it requires one. You’ll feel clumsy. You’ll write slowly. I tried writing this review on the Surface, but I would’ve missed my deadline by a week. You’ll get better—it will probably take weeks to hit a stride—but this thing was supposed to be a breakthrough. A perfect interface. Instead, it’s just a half-broken death march up the learning curve. The trackpad, sludge-like and jerky, is even worse—particularly galling compared to the super-smooth touchscreen—and unlike the keyboard, will never get better with practice. The Touch Cover also approximates, dismally, the sturdiness of a laptop: thanks to the cloth-like floppiness of the thing that’s necessary for making it easy to open and close, it can’t support itself on anything but a flat, rigid (apologies) surface. You can’t type on your lap, like laptop. It’s hard to imagine what a design solution out of this would have been, but that’s Microsoft’s job, not ours. Perhaps most galling is the Touch Cover’s $100 addition to the Surface’s already pricy $400 base MSRP—akin to selling your windshield wipers separate from the car. Microsoft also offers a Type Cover, that promises actual physical keys instead of the flattened solution, but that will add critical bulk to your Surface experience—along with an extra $130. Another letdown—and a pretty outrageous one. But it’s Windows on Surface RT that’s the greatest letdown of all, the lethal letdown, because it’s not Windows 8, but Windows RT. You can’t tell the difference by looking at them, but you certainly will once you use it. Windows RT is underpowered (everything opens and syncs slightly too slowly), under-functional (you cannot install a single app that’s not available through the Windows RT app store, which offers a paltry selection), and under-planned (the built-in apps can’t feel like Lite versions of something better). You’d be right to note that many of those limitations apply to the iPad as well, but no one could mistake iOS for OS X the way RT apes Windows 8. And even if it’s a plight common to tablets, Microsoft—for better or worse—has hyped Surface RT as being so much more. In the end though, this is nothing more than Microsoft’s tablet. And a buggy, at times broken one, at that, whose “ecosystem” feels more like a tundra. There’s no Twitter or Facebook app, and the most popular 3rd party client breaks often. The Kindle app is completely unusable. There’s no image editing software. A People app is supposed to give you all the social media access you’d ever need, but It’s impossible to write on someone’s Facebook wall through the People app, Surface’s social hub; the only workaround is to load Internet Explorer. Blech. Something as simple as loading a video requires a jumbled process of USB importing, dipping in and out of the stripped-down desktop mode, opening a Video app, importing, going back into the Video app, and then playing. What. The app selection, overall, is worse than the already pathetic Windows Phone app fare, looking like the software equivalent to a barren Soviet grocery store. The difference is that Windows Phone, used in quick, informative bursts, skates by on the strength of its excellent with integrated features. At the moment, there’s just not that much to do with Microsoft’s über-tablet. Surface is weak because Windows RT is weak; a tepid tablet OS pretending to be a computer’s. You can do work, yes. But productivity is limited to a “preview” (beta) version of Microsoft Office. It also hurts that Office requires plunging into Windows RT’s Desktop mode, where users of actual Windows 8 are able to install a decade’s worth of legacy software. Normally, this would compensate. But RT users can’t install any of this older software. None of it. Desktop mode is entirely worthless in RT, a cruel tease of non-functionality. It’ll only remind you of how much you can’t do with your Surface, and is going to confuse the living hell out of most people who buy one—especially when Surface Pro, built on x86 architecture and perfectly compatible with all of those legacy programs, steps in a few months from now. I pity Microsoft’s retail staff. No. 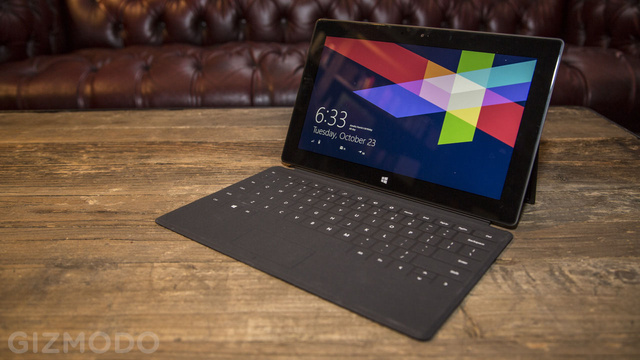 The Surface, with an obligatory Touch Cover, is $600. That’s a lot of money. Especially given that it’s no laptop replacement, no matter how it looks or what Microsoft says. It’s a tablet-plus, priced right alongside the iPad and in most ways inferior. That could change. Maybe there will be a new Touch Cover that retains the original’s terrific physical qualities while actually allowing good typing. Maybe the quasi-vaporware Surface Pro, which eschews Windows RT in favor of the real-deal Win 8, will make all the difference, opening itself up to the open seas of PC software (for several hundred dollars more). Maybe the app store will look different in a month, or a year, and have anything to offer. Maybe. But remember that Windows Phone—which has swelled from mere hundreds, to tens of thousands, to over a hundred thousand app offerings over the past two years—is still a wasteland compared to iOS and Android. Poor precedent. Maybe Windows RT will be different. Maybe. But those maybes aren’t worth putting money on. As much as it looked (and even felt) like it for a bit, the future isn’t here quite yet. This entry was posted in Computers and Technology and tagged apple vs microsoft, microsoft surface, windows 8 tablet. Bookmark the permalink.